School officials balanced the preliminary 2019-20 budget by cutting 232 jobs, including 120 teachers. The district cut or scaled back programs like purchasing text books, intervention to help students struggling in math and reading, SAT preparation, art and music, and science lab upgrades. “These cuts will devastate the Paterson public schools,” said Rosie Grant, executive director for the Paterson Education Fund, to the committee. Superintendent Eileen Shafer told the committee she needs $28 million to avert the layoffs and program cuts. Shafer’s staff presented a $526.45 million budget for 2019-20. $439.25 million, up $13.23 million from the previous year, is being provided by the state. She has said the small increase from the state was gobbled up by charter schools. The school district has to transfer $63.8 million to charter schools in 2019-20, up $9.42 million from the previous budget. Homeowners will have to pay 14-percent more in school taxes. Shafer has said classrooms may have 30-40 students next year. “It will make teachers want to leave the district,” said Karen Agosto, mother of two district students, outside the City Hall in Paterson. 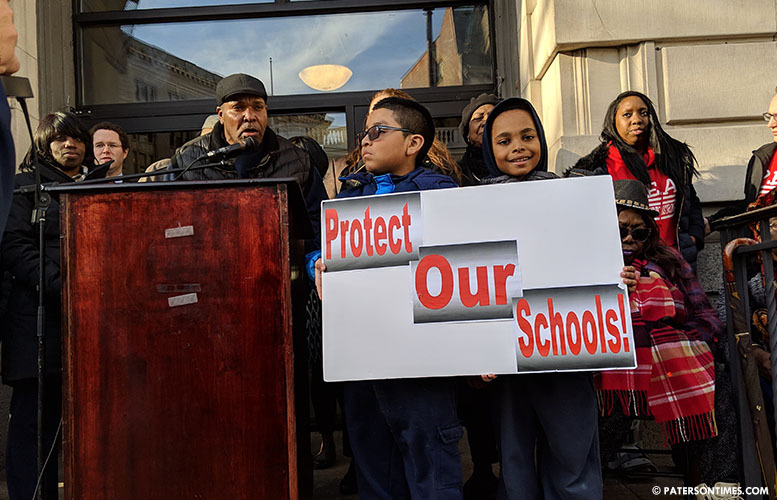 Community leaders held a rally outside the City Hall on Wednesday afternoon to protest the impending cuts and demand more funding from the state government. Earlier in the day, as many as 200 people went to Trenton in four school buses to ask state officials for more funding. Ryan Cohen, a social studies teacher at Rosa Parks High School, said his classes have 25 to 30 students now. Having 40 students in a classroom will be dangerous in the event of fires and lockdowns, said Cohen. Students in other districts have things like horticulture, carpentry, auto shop, and home economics, said Michael Taylor, whose daughter attends International High School. “Paterson doesn’t even have that,” said Taylor. He also pointed out the district has little or no technology for students to prepare them for the future. Last year, Shafer began an initiative to provide every middle and high school student with a laptop. School leaders, parents, and teachers were joined by municipal officials at the rally. “Those 28,000 kids belong to all of us. We have to fight to make sure they get the treatment that’s fair,” said councilwoman Ruby Cotton. “If we don’t fight now, they are going to lose later,” said councilwoman Lilisa Mimms. Shafer is part of the problem. Don't be fooled. She is cashing in. She outed the charters as the problem. And called for funds , Evans was mute because he was Christie's puppet.